Laminate has become an extremely popular flooring material. Based on the Fiberboard, it is used both in residential and commercial properties. Laminate is easily cut. This property makes installation of laminate flooring easy even for non-professionals. For high-quality installation of laminate flooring, you must know not only how to lay it, but also how to cut it properly. This material does not stand cutting negligence, which may result in defects. Let’s see what tools are best for cutting laminate flooring so that the laminate boards look like they were cut with a planer. Laminate is made of recycled wood products, that makes it very practically feasible. But you can not cut laminate with any cutter such as a hacksaw for cutting wood. It may seem this tool can easily cope with this task, but it has too large teeth that damage the top layer of laminate boards when cutting. It will also be hard to saw the pressed material with it. Another drawback is that the board edge after sawing will be ruffled. 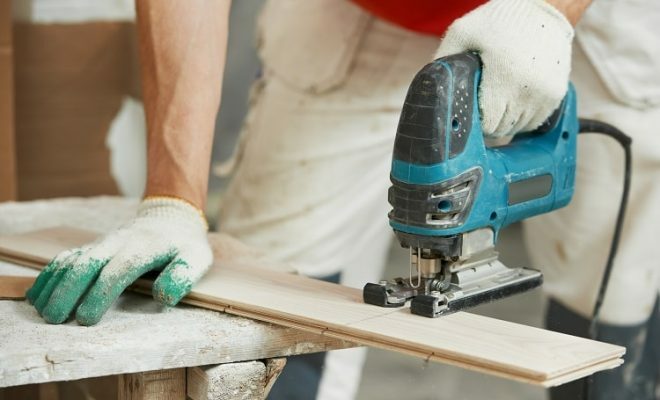 A hacksaw for cutting metal is a better option for cutting laminate flooring. Even though its small teeth damage the facing film, but not to the extent as when cutting laminate sheets with a hacksaw for cutting wood. Cutting laminate with it is quite tiresome, but it can be used for cutting a few laminate boards, which edges will be hidden from view. 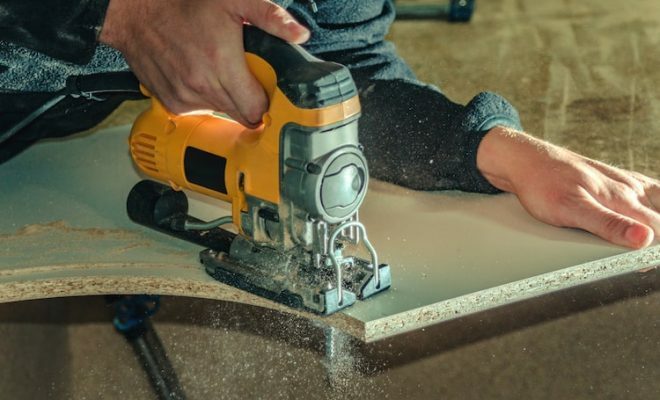 Since hacksaws are not the main tool for cutting any flooring, the methods of using them will be covered at the end of this article. There are other tools that are better for cutting laminate flooring. Of course, the modern laminate is better cut with power tools. Especially as almost any home master has them. 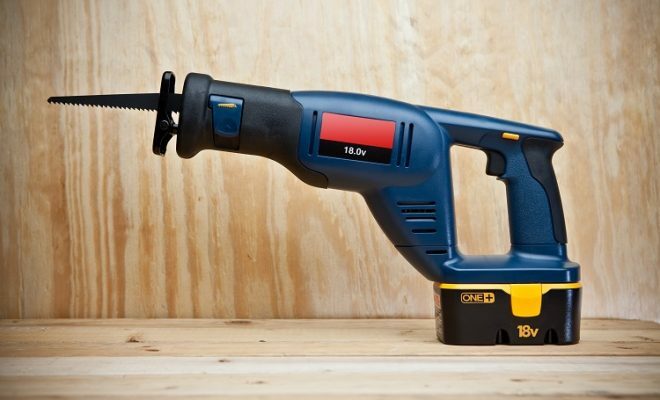 Electric jigsaw has very high performance. You will get high-quality boards without many efforts when using it. 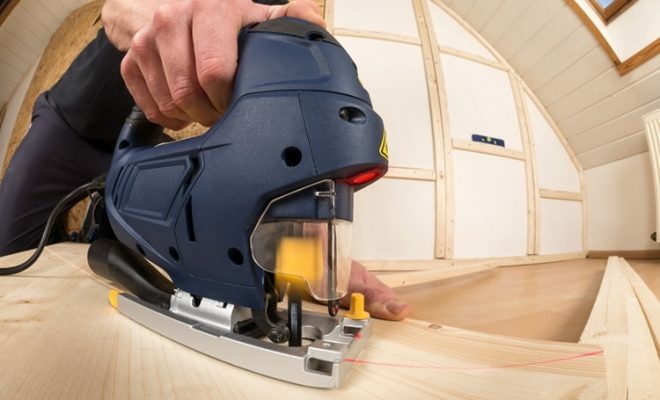 We do not recommend using other power tools for cutting laminate. A reciprocating saw is different from a usual hacksaw for cutting wood only in the availability of an electric motor speeding up the process, but not improving the cutting quality. A circular saw will be of no use with figured cutting and its saw blade is not meant for fine works. We should also mention grinders, which some “experienced” advisers recommend for cutting laminate. This tool is designed for cutting absolutely other materials. There is a special tool – a laminate cutter, though. But we recommend buying it only if you professionally install laminate flooring. 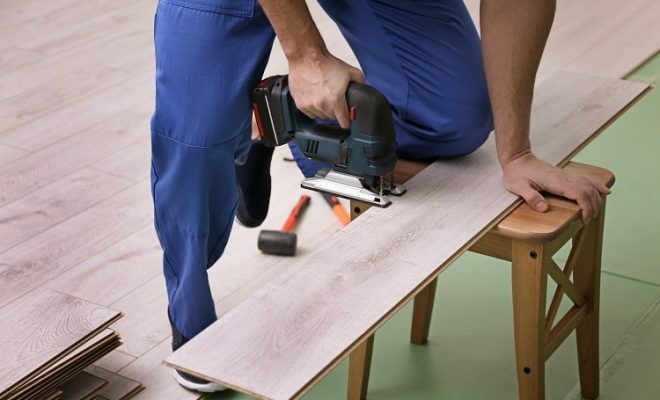 If you install laminate flooring once in few years, we recommend cutting laminate with an electric jigsaw. You can use a planer as well, but not everyone has it in his household. We should also note that cutting laminate with a jigsaw may result in chips on the front side of the laminate board. You should follow certain rules to avoid this. 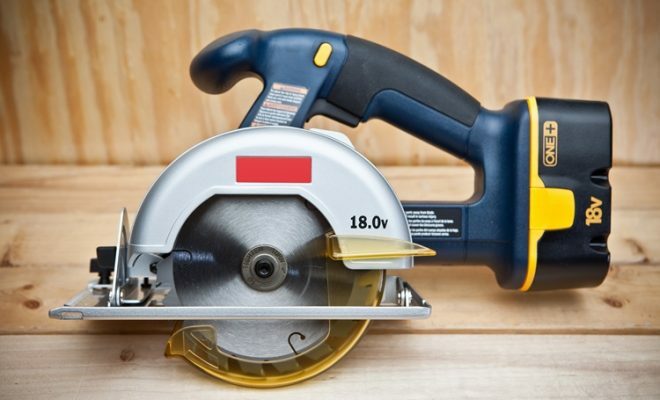 Cut the laminate with an electric jigsaw at the maximum speed of the electric motor. Try to cut through the entire cutting line at once, without slowing down and stops. The pendulum mode must be turned off. Use the blades designed for cutting laminate. If you don’t have such, attach blades with small teeth to your saw. The thinner the saw blade, the easier the figured cutting. Fasten the boards securely to the workbench with clamps before cutting. The jigsaw teeth are usually upward, so laminated boards must be cut face down. Thus, there will be no cracks in the laminate surface. The surface fragments along the cutting line are torn from the side of the jigsaw sole when the saw blade with teeth pointed upwards comes back. There are saw blades with the reverse teeth. When using such, a laminate sheet should be put on the workbench face up. A tape pasted along the cutting line will save laminate sheets from chipping. We should mention that the laminate (and not only laminate) is chipped because the rising teeth of the blade tear out fragments of the material, as it is not pressed along the cutting line. A simple fixture attached to the jigsaw sole will press an entire board. It can be made from medium-density MDF. The lining area should be equal to the area of the jigsaw sole. Make a cut in the MDF board equal to the distance from the front of the sole to the back of the blade. The lining should be attached to the sole with two strips of double-sided adhesive tape. We must admit such fixture is short-lived, but it reliably protects the laminate board from chipping. It also saves it from traces of the jigsaw sole. Of course, do not forget that high-quality cutting supposes marking an accurate line on the laminate surface. Now we can go back to the ways of using handsaws. Hacksaws for cutting wood with the smallest teeth are better for cutting laminate. Before cutting the laminate, draw a cutting line on it. Then, securely attach the laminate board to the workbench face up. Just like in case with using an electric jigsaw, attach the transparent adhesive tape to protect the laminate board from chipping. As for hacksaws for cutting metal, they can be used only for cross cutting. The hacksaw frame will be in the way when slitting. A hacksaw with a blade simply attached to the handle can be used, as it does not have this drawback. We should also mention one more tool that can be used for cutting laminate. You can not cut a lot of laminate with it though. Attach a construction knife to the ruler and make a deep cut along it in the board put on a flat surface. Then, break the laminate with your hands.